Lighting By Hammerworks is proud to offer these Elegant Colonial Chandeliers CH322 handmade in New England. 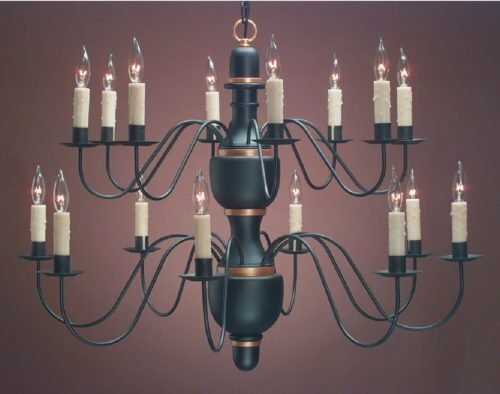 Our artisans hand turn these sixteen arm two tier Colonial Wooden Chandeliers using the same techniques as our Early American forefathers. In addition we form the antique tin or brass arms by hand. 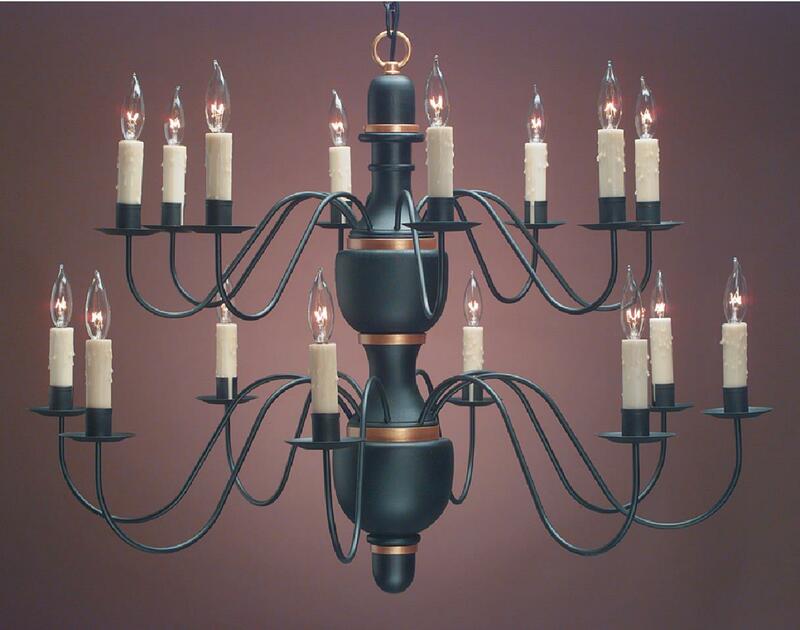 Most importantly with our various finish options you can completely customize your wooden chandelier. Thus you can choose from several Old Village Paint colors for your Country Wood Chandelier. Or if you prefer we also offer several Early American Reproduction Wood Chandelier stain options. Either way the result of this attention to detail is a custom heirloom quality chandelier. With its’ prominent size and style CH 322 is best suited for a stately dining room, entryway or great room. In addition the 16 arms are each UL rated for up to 60 watts thus providing ample lighting of any space. As shown here we also offer a selection of coordinating lampshades suitable for any of our wooden chandelier styles. No matter which you choose our Elegant Colonial Chandeliers make a dramatic statement in any setting. 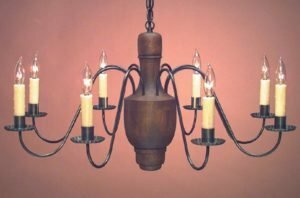 Many customers choose to add Colonial Wall Sconces to complement their Colonial Wooden Chandeliers. We offer a wide selection of antique copper, brass or tin Rustic Style Wall Sconce styles to choose from. No matter your decor style from primitive to formal you will find suitable choices within our collection. For example with its classic streamlined look you can easily dress up or down Colonial Reproduction Wall Sconce S111 to suit your needs. You will love the formal appearance of either the Carpenter Hall Tin Mirrored Wall Sconce S133A or Williamsburg Primitive Wall Sconce S141. For a truly rustic look choose Antique Reproduction Sconce S105 or Vintage Tin Wall Sconce S102. The choices are too numerous to mention here, so take a moment to browse for your favorites!